Lost in the mists of antiquity, what can we tell of the relations of man with water at the end of the Neolithic? One will probably never know how this story began. Although there are rare traces that date well before 10 000 years of men using canoes, mostly peoples of Central Asia and the Sahara, with a very different climate during the ice age. The caves of Tibesti contain scenes of hunting and fishing dating back to that time. Canoes were also found in the mud at random from excavations, also dating from the late Neolithic, and this throughout Europe. But it is mainly born out of necessity all over the world, in forms that vary according to the material More locally abundant, and the simplest (canoes and rafts) will still be built as long as forests exist. It is undoubtedly the simplest and most widespread boat in the warm woodlands. It was also that of Europe in the glacial era, since the work of dismantling the foundations of the old louvers made it possible to unexpectedly uncover the oldest European craft, a canoe dating back 10,000 years, when the shores of The seine were game birds and hunting area of ​​the woolly mammoths who came to quench their thirst. The word “Pirogue” is not widely used (The English say “Dugout”, the Germans Piroge, the Latin Trinchera …). It was necessary at the same time a light, solid and non-porous boix, because the techniques of waterproofing of the hull did not exist, From “burning” to wood fire, or coating based on vegetable wax or sap. The canoe seen above is in Balsa, coated with sap heated by wood fire, which gives it its dark color. In Zaire one continues to dig trunks of mahogany, the Framiré, and especially the Iroko, whose lifetime (which was that of the canoe) when dried was 10 years. In North America, the canoes were built of red cedar, an immense and resistant tree. These great canoes were painted in bright colors. The shapes varied considerably according to the region, but in general, canoes made of tropical wood had limited sizes and a tapered shape, dictated by the empiricism of speed. The African canoes then drifted to a soft assembled type of wood consisting of three main parts: a flat bottom, two siding plates, and two sleepers. It is this type that is currently manufactured, especially throughout West Africa . The oldest Pirogues were likely to resemble this one. It is indeed a boat in the most direct sense, because there is apparently no concern for hydrodynamics. Empiricism, however, begins to shape the front and back shapes, rather than keeping them cut clean, which undoubtedly resulted in a high resistance to water. The European Pirogues discovered and those which made the objects of archaeological reconstructions inform us about their technique of construction: A typical mesolithic canoe measured 6-8 meters by 50 centimeters, its weight could go from 250 to 750 kgs. And its section conformed perfectly to the shape of the trunk. The choice of a straight trunk was therefore important, especially as the knots were as many potential waterways. Softwoods were preferred because of a more impermeable wood and a lightness, as well as the ease of working it, without counting the straightness of the trunks, without knots over most of the barrel. Probably a stone anchor (found with remains of canoes), and walked with the gaffe and the paddle. For their construction, cut flint adzes, corners, masses and wooden sticks were used, as were the bone and deer scissors, the wire to be drawn and a flint lighter with tinder for the method of Digging by burning. First, the top slice was marked on the sides (pre-cut with the chisel and measured with the wire), then the wooden sections of this slice were cut in V on the adze and then removed, Using wooden corners typed to the ground, or with a corner of deer wood. The trunk began to be hollowed out. The thickness was measured with an arc-shaped instrument, followed by burning finishes: the latter eliminated the splinters and treated the wood naturally against the pests. Finally, the waterproofing was done by a mixture of beeswax of vegetable fibers in hot on the cracks. The lower part was generally thicker, as was the central part of the stern and bow, to prevent the wood from splitting on drying. In the Pacific islands, the canoe has very specific characteristics: It is fine and flexible, made of the nature of the trees used, and generally higher than wide. It requires a balance to ensure its stability, the “float” being connected to the whole by light, solid and flexible woods (like bamboos). The solution of the catamaran (a Polynesian word) came from this concept, marrying the advantages of the raft and the finesse of canoe hulls. It has definitely established itself in the pacfic and is today the happiness of the racing sailors. There were three types of pirogues in Polynesia: the one for fishing, with a single or double pendulum, was distinguished between the small Va’a (the most widely used word for “Pirogue”), for fishing in lagoons, A Motu for inshore fishing, and the Va’a Tira for deep-sea fishing. These were of catamaran type, and differentiated between Tipaerua, ranging from 13 to 25 meters, and sometimes double-sail, for passenger transport and inter-island commercial transport, and the Pahi, which was wider and longer , And made advantageous for expeditions, was often provided with 2 sails and maneuvered by 6 to 8 men. Finally the Pahi Tama’i were war catamarans, a little finer, without sails, and decorated in an aggressive and flamboyant way. They had in common a large central paddle, at the back of the raft formed on the two hulls, the “hoe”, a scoop, and an anchor in stone. Both the Tipaerua and the Pahi were considered by the Polynesians as their “fenua”, their territory, and bore the name of their lineage. When she landed on a virgin island, the latter took the name of the boat. We shall return to these latter vessels, which were not monoxylated and consequently move away from the subject. A simple light Polynesian fisherman outigger canoe. The Umiak is a less known and popular boat than the kayak, but it is older and has long been more widespread. Spelled umiak, umiaq, umiac, oomiac or oomiak, the Umiak was called the “women’s ship” as opposed to the kayak, “man ship”. 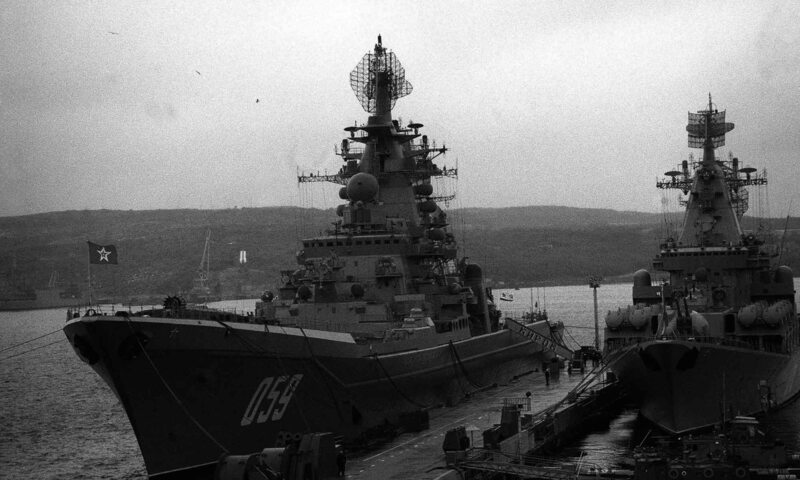 Slower, broader, higher in form, but also more complex and long to build, more material-intensive, the Umiak was propelled by paddle and sail, which, modest, was erected at the front. Its hull used the same construction techniques as the kayak, but its architecture was different. Thus, the umiak was assembled by three large “spars” of driftwood, or possibly six solidly assembled, forming a central section in an inverted triangle. The two upper side beams were pushed back in the center and tightened at the front, giving Hydrodynamic line to a very old ship dictated by empiricism. More stable than the kayak, it was nevertheless often weighted, and could carry all that the Eskimos could carry away during their displacement (they are often nomadic tribal societies, ranging from hunting area to hunting area, summer). A umiak asked for no less than seven sealskins and more, was one meter fifty wide and sometimes 6 meters long and more. Only the size of the available driftwood dictated the size of the vessel. Couples were bone most often. The fittings between the skins were particularly well treated, the vessel serviced weekly. The hull coating changed every 2-3 years. 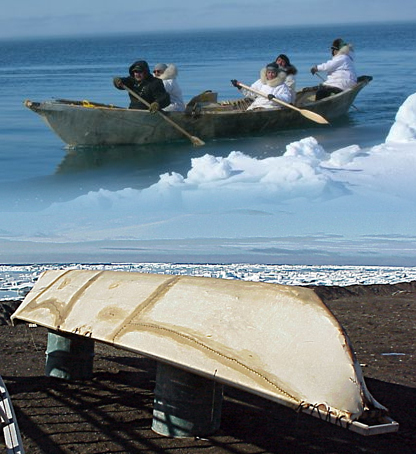 Beginning in the 1960s, the Eskimo civilization discovered among other things modern kayaks made of plastic or fiberglass and adopted them, but the aluminum umiak never really succeeded in implanting, because of its cost And the difficulty of maintaining and repairing it… The Yupik and Inupiat of Alaska in particular, continue to build traditional umiaks for their everyday life . 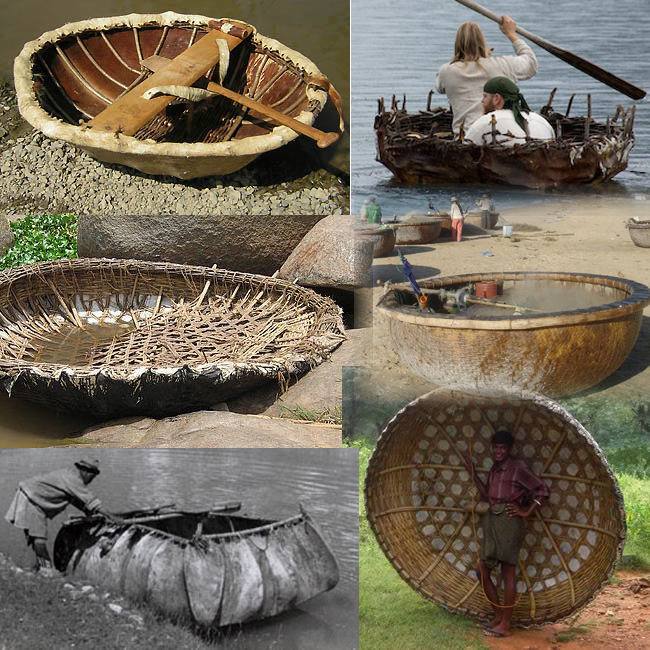 Description: Different types of coracles throughout the world. Above left, traditional Irish Curragh, representing a very long Celtic tradition. On the right, the Scandinavian Coracle, used by the Vikings mainly for river transport and lake fishing. Below left, Traditional Coracle of the Tiger (Iraq). On the right, Coracle in coconut fiber for South Vietnamese coastal fishing. Below: Coracle Indien. Left: Ku-Dru or Tibetan Kowa. The name Coracle, also related to Curragh is of Gaelic origin, (cwrwgl). This is the composite basket boat used probably as early as the Stone Age on rivers and lakes around the world. Its size is above all dictated by the materials, its shape by the calm navigation of lakes and rivers rather than marine or even river. The basket-boat was made of skins sewn together and fastened with a wooden or bone structure, or both, so as to have a vaguely or precisely hemispherical shape. Very simple, with a flat bottom and without a keel, the Coracle required only wood of recovery of small size, and its surface could be covered by two or three skins sewn only. On the other hand, it required numerous tendons or twines for its attachments, and the skin had to be treated carefully, including its fittings. But the Coracle had a fairly good longevity because of its navigation in fresh water, salt water, compared to ships in marine skin like those of Eskimos, attacking and deteriorating leather. The coracle was used in antiquity and known in this way, as an archaic lacustrine and river fishing vessel throughout northern europe. It existed in many versions, but most were light and single-seater. Its large size allowed the carrying of loads, it could easily be carried on the back of a man and was even used in battle as additional protection to the shields. On the other hand, its shape made it a stable vessel but slow and awkward, with an important inertia due to its shape. Coracles were built all over the world, in Persia, Mesopotamia, Viet-Nam, and North America. A “voyager”, a kind of large Amerindian Canoe of the XVIIIth Cent. The Britsh, Scottish but also in particular French trappeurs et coureurs des bois made these their main transportation system. The Canoe is one of the best known traditional boats without sails, used at very old dates. It is often likened to the canoe, for it probably derives from the first canoes made of simply dug trunks. But the true canoe, a symbol of Native Americans, especially Canada, is truly unique in northern America. The classical canoe was made in the manner of the Eskimo ships of which it is probably an ancestor. It was made of wood and bark or skins sewn and bound, had solid shapes, a slightly raised front and a rear and a Which allowed it to move on all liquid surfaces, from rivers to the largest rivers, through lakes, rapids and torrents, and even coastal maritime areas. Rivers of Canada, great lakes, bays, were all ways of travel, which have always been an integral part of the life of the Americans, as well as European pioneers who adopted it as soon as they arrived. Derive the current canoes, were built entirely of wood and sometimes covered with linen, lined and resined to be impermeable, and provided with a keel for stability and solidity. Such canoes were able to face thanks to their solidity , Their suppleness, their stability, and their lightness, the most frightening rapids, even the cascades. 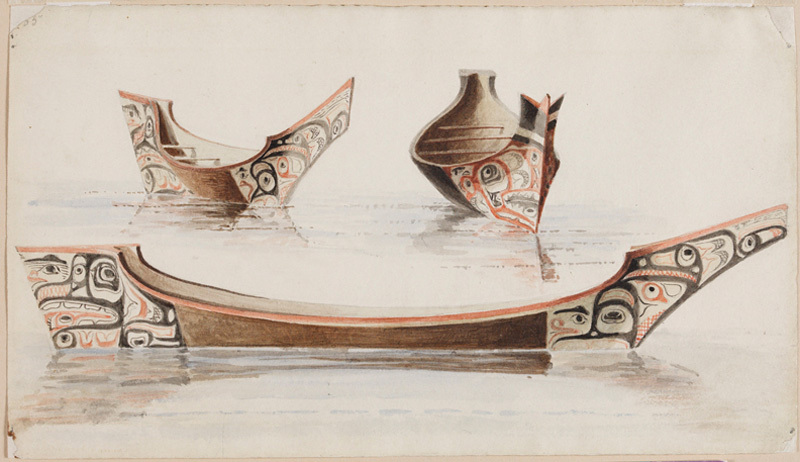 A reconstruction Photo of the Canoe of the Haida, a masterpiece of the know-how of the Indians of the Northwest Pacific. Excavated in 1878 in a trunk of cedar, this canoe of the Indians Haida testifies of what could be a “pirogue” in its most monumental versions. With 16 meters of length, it is one of the most beautiful examples preserved until today. This canoe was used for whaling. Profile reconstructed from photos of the museum of natural history, central park, 79th street in New York. The composite canoe, made of wood and skin, dating back 4000-5000 years, was generally large enough for at least two people to embark, but many variants have emerged, the largest, built entirely or partially out of wood, Reaching twenty meters, such as the great canoes of war of the Indians of the great lakes. These canoes were brilliantly decorated at the prow and stern, very raised, large enough to carry 20 to 40 people. They were eventually carried on the back of a man, for the smaller ones there again thanks to their light composite structure. The biggest ones were drawn on the bank and returned to the shores. Passengers, trappers, and pioneers were thus able to travel great distances over the rivers, carrying their canoes, their affairs on their backs, and foot-passing non-negotiable falls. 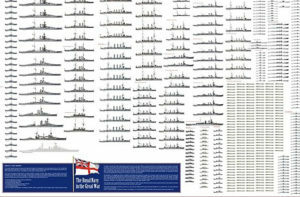 Many variants existed, but in general the sections of the ship married “Y” shapes at the front end, “U” at the center, and “V” halfway. Some had more flared sections in the center, others were more delicate and more unstable, especially war canoes, created to “intercept” those of transport. Their bow and their recessed muscles, the keel forming a real loop at its ends, was another of their immediately recognizable characteristics. Modern canoes have more pointed ends, even flat “boat” type. Preserved Canoe of the West Coast, showcased near Astoria Column, Long Beach. Above, magnificient NW USA Amerindian dugout-Canoe. Thör Eyerdhal in the seventies. He was, despite his disputed theories, a great experimental archaeology pioneer. Kon Tiki in Olso Museum. Thör Eyerdahl, born in Norway in 1914 and died in 2002, was one of the great pioneers of a new form of science that has since flourished: Experimental Archeology. An ethnologist by training, he quickly became interested in the migratory movements of the peoples of the Pacific, studying Polynesians and South Americans. It was soon controversial for his theory that the South Pacific and Polynesia were colonized by South Americans, while the opinion gained in the scientific community was a colonization coming from South-East Asia. Today, we would proceed by taking samples and analyzes adn. At the time (1946), he had no other possibility to support his theory than to put it into practice by constructing a raft of trunks of balsa, built with smart and a prehistoric technique but whose know-how Was partially transmitted in some lacustrine production (to the Andean lake titicaca for example). The Kon-Tiki (in reference to Con Tiki Viracocha, the sun god of the Incas) had a sail, a hut, and was just enough room for a crew of 6 men, researchers like him, enthusiastic about the idea project. Its financing is largely personal and on funds of scientific sponsorship, because the scientific community does not provide any assistance, even treating its project of smuggling and predicting a failure. However, after an epic film trip that lasted three months, it finally fails to the touamotu, becoming the day in the world-famous landemain (his work that describes the expedition participates greatly), but always met the skepticism of a major part of the The scientific community, whose researches will end in much later on. Propagated on the international stage, Thör Eyerdahl now has all the necessary funds to continue his research in experimental archeology. After his excavation and research campaigns in the Galapagos and the Easter Island, he devoted himself to a new expedition, this time aimed at proving that the ancient Egyptians could have crossed the Atlantic and influence prehistoric Amerindian civilizations. The negroid face of an Olmec god, the graduated pyramids, in fact advocate for a valuable part of the historians the theory of a civilization at the origin of all others, probably based in the basin of the Indus, and then colonizing Mesopotamia and finally Egypt. To do this, he built a new boat, this time with papyrus, with bipod mast and other characteristics of the old dynasties (2500 BC). The Râ I left in 1969, crossing the Mediterranean, then starting Its journey in the Atlantic, but it is a failure. The papyrus becomes impregnated and loses its buoyancy. In 1970, he re-experimented this time from Morocco with the Ra II, and ended, following the sea currents, by touching the ground with the barbade, proving his theory again, at least on the experimental level. It is known today with the comparative studies of the DNA strains that the first pyramids with degree are local creations, sui-generis, and the same with those of Egypt. The myth of the first civilization is today discredited. In 1977, when the celebrated scientist (who flies to Captain Cousteau), now turns 63, he built the Tigris, a large raft of reeds, to prove the connections between the Mesopotamia of Sumerians and Africa The northeast and the Indian Ocean and in particular the valley of the Indus. He sailed to the horn of Africa, crossing the Red Sea well, but was burnt by his international crew in Djibouti, under the aegis of the researcher, in protest of the war raging on the spot. Eyerdahl grew more and more with the international organizations as limiting of the peace and ecologist. His last scientific theories concerning the mythical ancestors of the old Swedes did not receive much credit from the specialists. Nevertheless, his commitment and his media prowess earned him world fame and 11 honorary doctorates from major American and European universities. His legacy continues to emulate, even though science, with modern technological means, has immensely progressed since and reversed many of its theories. A recent reconstruction, the Mata Rangi III of the Spanish Munoz (navistory). Reeds of Lake Titicaca in Bolivia, as well as those bordering many of the great rivers, have been, for want of large trees, the material of choice for construction, from baskets to huts to boats. Thanks to their hollow structure, gorse once braided and bound together over the surface of the water do not fill and allow an archaic vessel to float permanently, and to serve as a means of displacement. Thus, the Andeans of this lake know a know-how lost for millennia, since the wood was implanted throughout the antiquity, relegating the flexible ships in rush in the obscure beginnings of the navigation. Reed boats like the Peruvian totora are constructed much like braided baskets, with both ends curved upward. Their manufacture seems quick and easy, but it requires prerequisites and experience. The Jangada is undoubtedly the oldest type of ship known, and undoubtedly the first composite ship (made of several pieces) that is the origin of a lineage that continues today and represents hundreds of thousands of types of ships, Boats since then. The canoe, made of a single hollowed out room, left no offspring except the canoes to be balanced, but which already rank among composites. Pirogue and rafts are indeed the first types of wooden ships, in coccurence with the braided baskets that were ships in reed. The raft, made from the simple discovery of the buoyancy of raw wood, is the logical consequence of the assembly of several branches, logs, treated or not. He was soon added an indispensable accessory, the gaffe, then when the bottoms were too high, rowing. The construction techniques of the raft were in some respects less pointed and less restrictive than those of a canoe. Moreover, its stability was much better. On the other hand, its speed was less than that of the canoe and it was much more difficult to manipulate or manipulate, its large surface being a source of inertia. 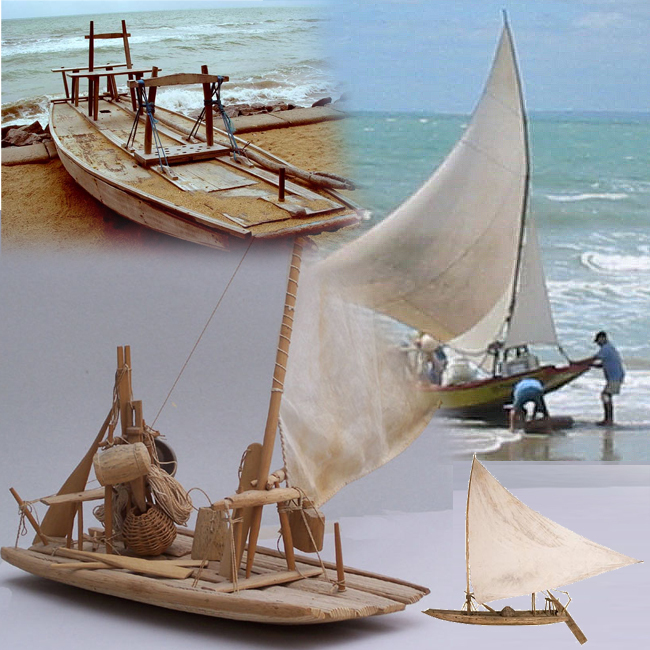 Nevertheless, rafts rapidly spread over all continental liquid surfaces, lakes, ponds, rivers and rivers, since the somewhat loose and low structure of this type of craft made it in principle unfit to face the sea Evolutions led to its improvement with the modern jangada, which it was able to become a coastal fishing vessel. It is in Brazil, on the northern coast which has long been isolated, that these rafts of balsa have characteristic forms, so much construction and equipment probably have not varied since its invention, about 2500-3000 years Av.jc. or more. The vestiges of such a ship are rarely found to be untraceable due to the putrescibility of the balsa used to make the raft itself, the climate, the nature of the soils (no acidic soils, poor in bacteria as in Scandinavia). .. 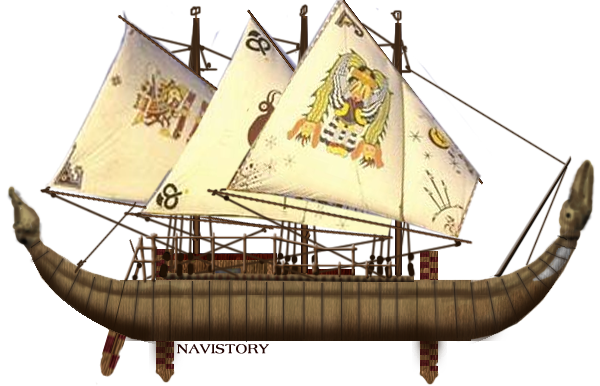 The jangada is composed of a floor made of balsa trunks of reduced size (the jangadas of fishing do not exceed six meters), a retractable drift passing through one of the trunks, a light rudder associated with a Bench, and a single mast with sail to the third, fruit of a emprique evolution. The first sail was probably square. 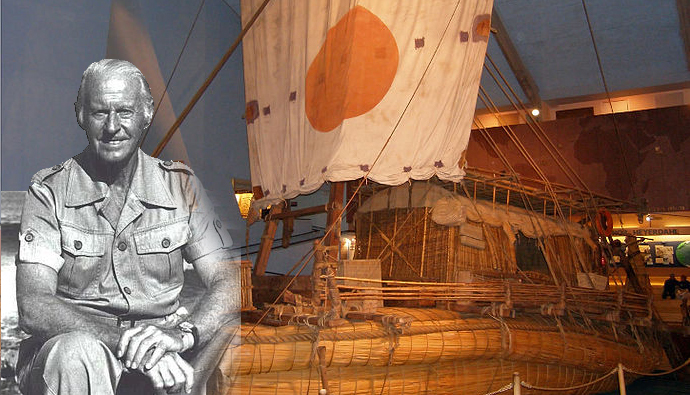 The balsa rafts were unique to the east coast, they were also found on the pacific facade of south america, Thör Eyerdahl trying to demonstrate with his Kon Tiki, a kind of large jangada, that these ships could Traveling. It is certain that balsa had advantages over braided gorse, but it was a porous material that imbibed as a result of long exposure to sea water, which happened at Kon Tiki and nearly cost Dear to his crew. The jangadas are thus rather coastal boats made for fishing campaigns of about ten hours at most, the wood then drying in the sun. The rafts were born on rivers of continents and were adopted by the Chinese (originally junks), the Egyptians (nilotic rafts, originally gayassas), and was also likely to be used as ferryboats and Boat throughout northern europe. 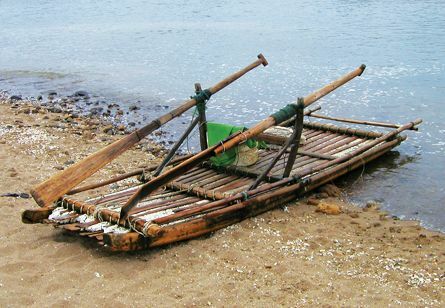 Chinese raft, derived from a template perhap 2500 years BC old. If the junk is well known, it dates only from the 2nd century AD. Jc. But its shape and characteristics have remained virtually unchanged since then. Studying the precursors of these offshore vessels necessarily means studying ancient Chinese river boats. It goes without saying that according to the period studied, going back to the first dynasties, it is complex to draw up a detailed picture of the types of boats of the time. However, thanks in particular to the engravings and the models, it is known that the Chinese built impressive ships to navigate the immense yellow river, with a flat bottom, a very wide hull, and overlapping constructions superimposed like the steamboats of the mississippi Can compare them in terms of size and river specificities. The dragon boats mentioned since time immemorial were only the most spectacular and sumptuous manifestation of a lineage of large river ships that was already over 2000 years old. The junk, like the Chinese river boats, were all characterized by an optimal use of the wood, with an assembly giving flexibility, lightness and solidity. Empiricism, of course, was at the origin of this evolution, which began logically with the first rafts in the semi-mythical period of the “three sovereigns and five emperors” from 2852 to 2205 – It is said that it is Fu Xi who These rafts had common characteristics specific to this type of craft, but the Chinese specificity was to introduce a primitive shell to these boats, simply by raising the edges and then applying two planks of flange to the flanks. The “half-barrel” shape was also a classic that resulted in a whole family of Asian ships and boats, especially prevalent in the southeast. According to what is known, traces of craft were found by Chinese archaeologists and dated more than 7000 years. Hemudu (near Yuyao, Zhejiang Province) was also found in the ground by excavating places corresponding to the old banks of the Yellow River, from 3000 years BC Whose elaborate form testifies to the empirical value of a usage consumed for dozens of generations. The palm in prow is a pattern found systematically on these Gerzéens ships (Upper Egypt and Nubia). What is its exact meaning? I leave this to the specialists of the archaic Egyptian period. Is it a symbol of belonging to the country? Had this palm tree a more prosaic utility, was it a lucky charm, a comforting symbol for the crew who saw in the open sea a reassuring sign of promise of return? The bird was also revered in the same way (see “bird-boats”), since in the open sea, far from the coast, the presence of a bird at sea indicated the land nearby. Always it is that the symbol will later be found in the form of Lotus leaf that will be worn by many ships of the dynastic period. There are also signpost masts (without sails) on many engravings. The question of sailing is contested, but it appears clearly on one of these engravings, and the typical rigging at the back of the folding masts (double or simple, the hypothesis remains) pleads for the use of sails. The very large number of paddles, systematic, as well as the central interruption, suggests that these vessels, which were very taut and probably quite fine, had a total of 64 rowers, which seems enormous in comparison with later units: Never on engravings and posterior bas-reliefs, and up to 1000 BC. JC., From Egyptian ships to more than 16 rowers on board. It goes without saying that 64 rowers would represent a considerable weight on a soft boat … My personal opinion is that the engraving has, above all, a symbolic charge, representing not a fringe, but both swims simultaneously, Reduces to 32 rowers, 16 per boat, and this is much more reasonable. Another fact is that only the Minoans and then the Mycenaeans, the possible inventors of the Pentecontore (25 rowers on board) were able to build such ships only with the introduction of a radically new method of construction, with keels and pairs. It seems therefore logical to consider that exceeding 20 rowers on board was already a challenge with the technique of soft boats. The “double cabin” systematically represented in the center is interesting because some engravings diverge on some points but agree on their shape: They are high (much more than the height of the hull), very close together, some even have a “footbridge “Intermediate. All have two or three semicircles on their summit. Are these representations of human heads “exceeding” their summit, swellings of decorations, “crenels”, shields? The structure of these “cabins” also seems to be stratified horizontally. It may appear that these high cabins are shelters for the crew in rainy weather, in the case of a merchant vessel. But it could more probably be “tricks”, and more likely likely rounds of archers. Three things support this hypothesis: The number of rowers, speed-oriented, little useful on a merchant ship or traditionally sailing, had the leading role, the fineness of the hull, not really that of a merchant vessel necessarily more bellied, And the absence of representation of goods carried away, argue in this sense. There are also the signboards of masts, which are rather conspicuous, more useful for recognizing themselves in battle than on merchant ships. These engravings also show various symbols, two triangles, a “double horn” depicted above, a quadruple cruciform horn, or an elephant … One of these engravings shows an anchor, Front, the classic symbol of soft ships, consolidated by holding lines in prow and stern. But we can also see two representations of what could most probably be a merchant ship (higher), without a masthead symbol, with a hull always very tontured, a sail in the rear with two lateral rudders, a cabin ‘Before and apparently no oars. The following are illustrations taken from other engravings. We see a merchant ship (Fig. 2), with a cabin in the back this time, surmounted by a “wheelhouse”, a “footbridge” since it is unambiguously seen a man leaning on a railing. The figurehead appears to be a bird’s head surmounted by a “crown”. It can be a merchant vessel. The second illustration (Figure 3) shows a slightly different hull design, with a central cabin, numerous rowers, and a figurehead more difficult to pin down, perhaps a symbolic evocation integrated into the hull of the “palm tree” Other military vessels.